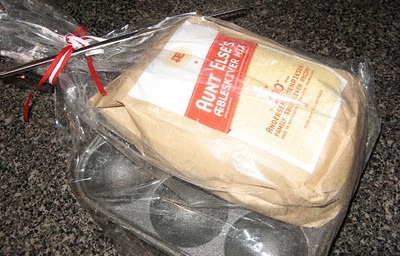 I met Chad, the President of Aunt Else’s Aebleskiver at the FoodBuzz Blogger Festival last month as he demonstrated the making of Aebleskivers (Danish for apple slice). 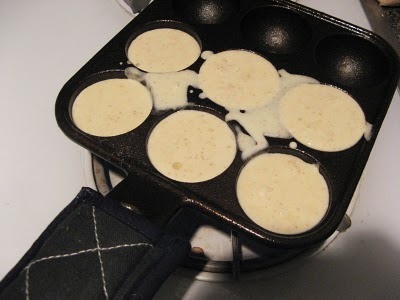 He actually got his inspiration from Japanese Takoyaki, which was the first thing that came to my mind as I watched him turn each round puffy aebleskiver skillfully (making 9 at a time). 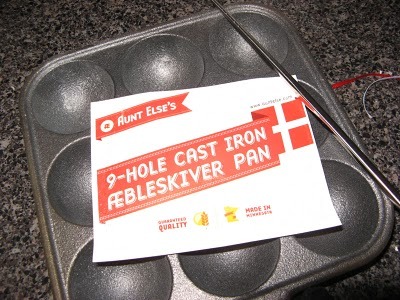 It looked like too much for a non cook like myself to handle, but he insisted I was the “perfect customer” and how with a little practice, even I could be a skilled aebleskiver maker, so a couple weeks ago, he sent me a complimentary kit to try. As a Chubby Fan, you can get yours with a 10% OFF your entire order (during checkout, add Chubby Chinese Girl Blog to “add special instructions to the seller” and the 10% will be taken off after order is placed. Now, making these little treats seemed hard, but I was confident I could do it solo. Then I read the directions of “seasoning” the pan, and that’s when I turned to Piano Boy for help. You see, I have a subtle oven-phobia, where I currently store my pots and pans, so he was the perfect person to turn to for this one time process. 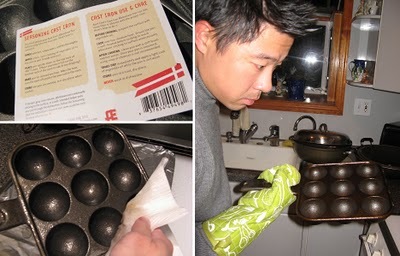 Basically, coating the pan with oil and baking it for 1 hr and letting it cool before use. After about 2 hrs, voila! 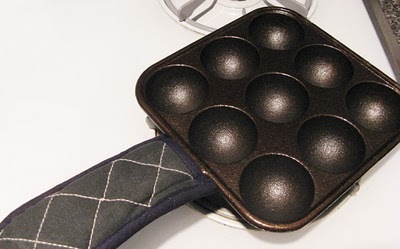 I had my new “seasoned” pan. Very proud we did it, and no, I couldn’t have done this part alone, but thankfully it’s one time only. 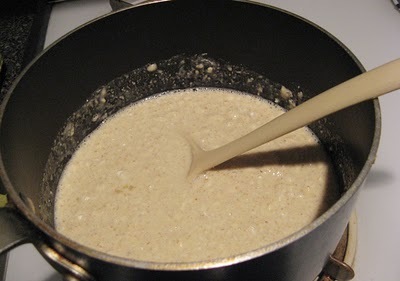 The pre-packed mix (a family recipe), eggs and water. 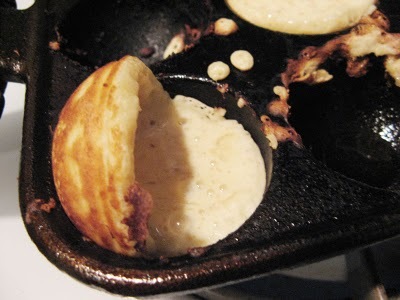 Finally time to make the aebleskivers! 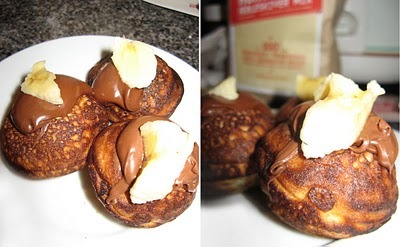 I filled them with banana and topped with nutella. 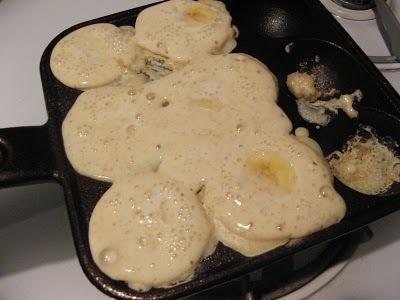 Apparently I poured too much into each hole and forgot to brush the edges with oil, therefore a sticky mess. 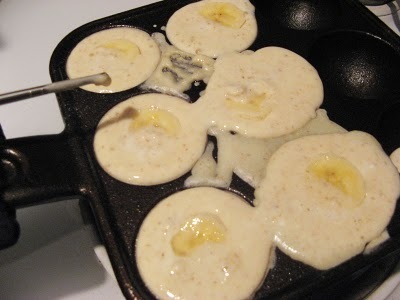 Filling it with some banana. Rotating them slowly at a 45 degree angle. Ta-da! 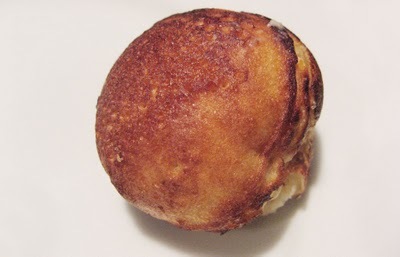 here’s it is, my first perfectly round Aebleskiver. 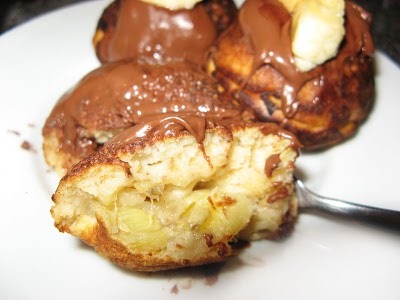 I topped them with Nutella and Banana. Here’s the center, filled with banana. 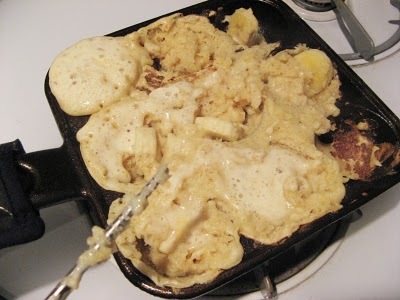 It’s like a crepe-ish/pancake on the outside and a little pancake/takoyak-ish in the center. It’s warm, soft and a mouthful of yummyness. Turned out to be pretty easy to make, great treat for anytime of the day. I like how I could get creative with both sweet or savory fillings. Next time, I’m thinking purple yam and some toasted marshmallow on top, or a mini pizza with some cheese/sausage center topped with tomato sauce. Love the endless possibilities. Special discount for Chubby Fans 10% off your entire purchase! During checkout, add Chubby Chinese Girl Blog to “add special instructions to the seller” and the 10% will be taken off after order is placed. Nutella is a great idea. I might try raspberry this week! that's a great idea! red bean paste it is! Yay! So glad you got the hang of it!